Shirvan is located just to the south of the Caucasus mountain range and is to the east of Gendje and to the west of the Baku peninsula. 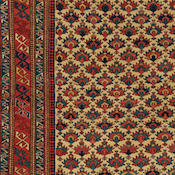 Local weaving tradition in this region excelled in exploring the numerous possible variations using a limited palette of color to maximal effect. 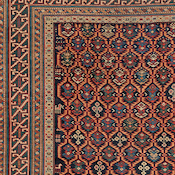 The area rugs and a very limited supply of antique runners woven in the Shirvan district are the most finely knotted and sophisticated antique carpets of the Caucasus region. 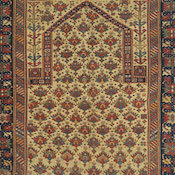 For example, this iconic Caucasian Shirvan antique rug is striking in its elemental simplicity. 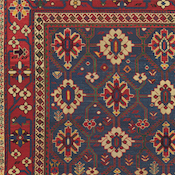 Its innovative twin medallions are rendered in stark clarity upon a backdrop of the deepest indigo, giving each facet of this antique Caucasian Shirvan rug’s original geometric ornamentation great graphic impact. As in so many of the most accomplished works of art, not a single line is wasted, as all aspects are brought together with a natural, profoundly satisfying balance and symmetry. 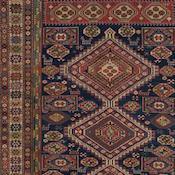 Antique Shirvan Caucasian rugs of this caliber ceased to be produced around the turn of the 20th century. 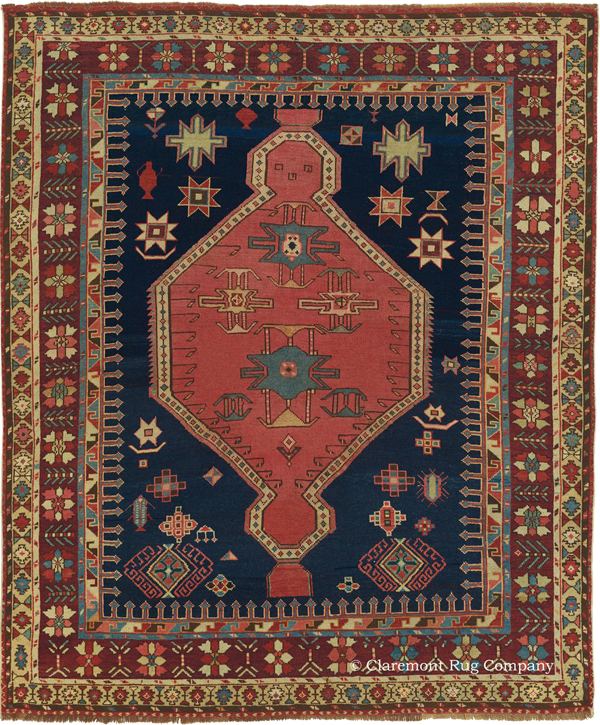 “With the completion of the Trans-Caucasian railway in the 1870s, the whole area rapidly opened up to European dealers, who were capable of buying on an unprecedented scale, and huge numbers of rugs were transported westwards from Baku and Gendje. 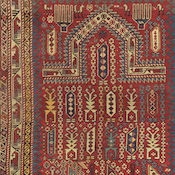 As a result of European demand, Shirvan and Kuba rug design in the late 19th century initially became more intricate, with increasingly fine weaves and knots. 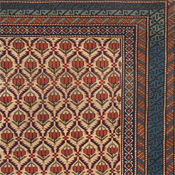 By the 1890s, this unrelenting demand led to the establishment of carpet workshops where commercial dyes were used.  Designs were simplified and became symmetrical. 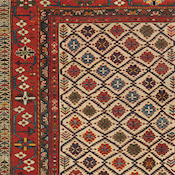 The small, secondary motifs which gave Caucasian rugs much of their charm were excluded, so that any hint of individualism was lost” (Middleton, Michael, Rugs & Carpets: Techniques, Traditions & Designs. Mitchell Beazley, London, 1996, p. 60).